By the 1800s, however, such names had become widely distributed and no longer had any particular status connotation. It is likely that the name Brodowski once belonged to a single family in greater Poland, but over several centuries, the name was disseminated through the Polish feudal system, in which peasants often took the name of the noble on whose land they lived. By the 1700s, Brodowski families resided in many areas of present-day Poland. Beginning in the 1700s and continuing into the 1900s, Poland was subject to war and partition by neighboring countries, which had gained power over Poland. This resulted in an influx of ethnic Germans, Swedes and other invaders. Poland was already a rather cosmopolitan country, being a major trading center since about 900 AD, which attracted peoples from many other countries. Poland had opened its doors to many Jewish settlers very early and also had a major early influx of Italians. The partitions however, resulted in the displacement of many ethnic Poles who were driven from their ancestral homes to make way for Germans who were resettled in Poland by the German empire. The late 1800s saw the forced Germanization of many Poles, during which many Polish landowners lost their property to German families and Polish language and culture were actively repressed. Poland ceased to exist and Germany claimed the area that is now Poznan, renaming the area Prussia. As late as the 1870s, many rural Polish people were still living in feudal conditions, in which they were literally the property of the landowners whose property they farmed. These peasants survived mostly by raising sheep and growing wheat as well as subsistence crops. They had few sources of income from which money to travel could be obtained. It was from this period of difficultly and unrest that the Brodowski family and many other Poles left for a better life in the United States. 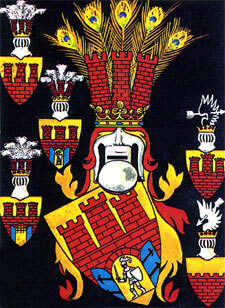 The Brodowski family of interest to this discussion originated in rural Poznan province, in the area, between the present-day cities of Poznan and Bydgosczc. The earliest record of the family occurs in the town of Swiatkowo in the Bydgosczc voivoidship, which lies about 40 miles northeast of the city of Poznan. The records of the Catholic church at Swiatkowo list the marriage of Martinus Brodowski and Marianna Antoniak in 1871. Martin was born in 1851 and Mary in 1854 according to their death certificates. Both were likely born in the Swiatkowo area, as families were not highly mobile at this time. Martin's death certificate lists has parents as Albert and Apolonia Brodowski, both of whom probably also lived in the area. Mary's death certificate incorrectly lists her father as Michael Antoniak and does not list her mother. By the time of her death, it seems nobody knew or recalled her mother's name. This was not uncommon, as Polish immigrants appear to have talked little about the "old country" to their children. The old country was not remembered fondly, and most immigrant Poles were seeking to shed the old ethnic and regional identities that often caused problems in Poland. Instead, they were eager to Americanize and although they were proud of their Polish communities and culture in the US, they seemed eager to discard the memory of Poland the suffering of those who remained. Mary's parents were Peter Antoniak (b. 1819) and Francisca Galwas (b. 1826), who were born in Kozielsko, Poland. Peter died in Poland in the 1870s, but Francisca emigrated to the US with her son Anton in 1880. When Marcin and Mary emigrated in 1871, most rural Polish farmers lived in primitive agrarian conditions. All transportation was by horse and few would ever have seen a train or railroad. There was no electric light or running water and homes were heated with wood. All cooking was done over an open fire and people awoke at dawn and went to bed shortly after dusk. Child mortality was extremely high and even minor illnesses and injuries could be life threatening. Most rural Polish peasants at that time spoke Polish and understood German, but few could read or write. The prospect of a journey halfway around the world was consequently, a daunting proposition, which few Polish peasants could even fathom, let alone achieve. Martin and Mary Brodowski, however, decided to undertake the journey, probably for the same reasons as most Poles of their time and region. Many Polish men were facing conscription into the Prussian Army and life for Poles was becoming much more difficult. The Polish language was being actively repressed and Poles began to encounter discrimination in their own land. Ethnic Poles, who were overwhelmingly and ardently Roman Catholic were experiencing discrimination from Protestant Germans who were settling Poznan in large numbers. All Polish cities and towns were rechristened with German names, the city of Poznan becoming Posen. The young couple consequently, appears to have left for America shortly after their marriage. 1871 was relatively early for Polish immigration. Only a few small Polish communities existed around the US and Milwaukee's Polish community had only recently begun to develop. Martin Brodowski appears to have come to the US first in 1872, traveling alone. He appears in the New York passenger lists on June 13, 1872 aboard the German ship Carl, which departed Bremen, Germany for New York at the beginning of June. Martin listed his occupation as that of a Farmer and his destination as New York. Martin probably came ahead of Mary and worked to earn enough to pay for her passage. Mary does not appear on any passenger lists yet found, but she likely came in the summer of 1873, arriving through either New York or Montreal, as daughter Victoria was born in New Hampshire in September of 1873 (US Federal Census). It is likely that Martin and Mary began their trip from the Swiatkowo area on foot or horseback heading for the nearest railroad station, probably at Poznan, a few day's journey from their home. From there, they likely went by train to Bremen or Hamburg where they embarked on a ship. Often the ships stopped at Liverpool en route to the US or Canada. 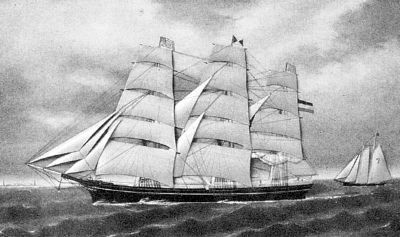 The voyage across the Atlantic took about 3 weeks, and in the 1870s, was still often made on a three-masted sailing ship. The Brodowskis had almost certainly never seen the ocean before and most people quickly became miserably sea sick. Within a few days, most travelers gained their sea legs and were able to keep food down, but the conditions on the immigrant ships were usually less than ideal. Polish immigrants often spent years saving money for the voyage and seldom invested in deluxe accommodations. They traveled in steerage and berthed in an open common area below deck. On board, disease was rampant, as the ships generally hosted a healthy colony of rats, and occasionally a traveler or two would die during the voyage. 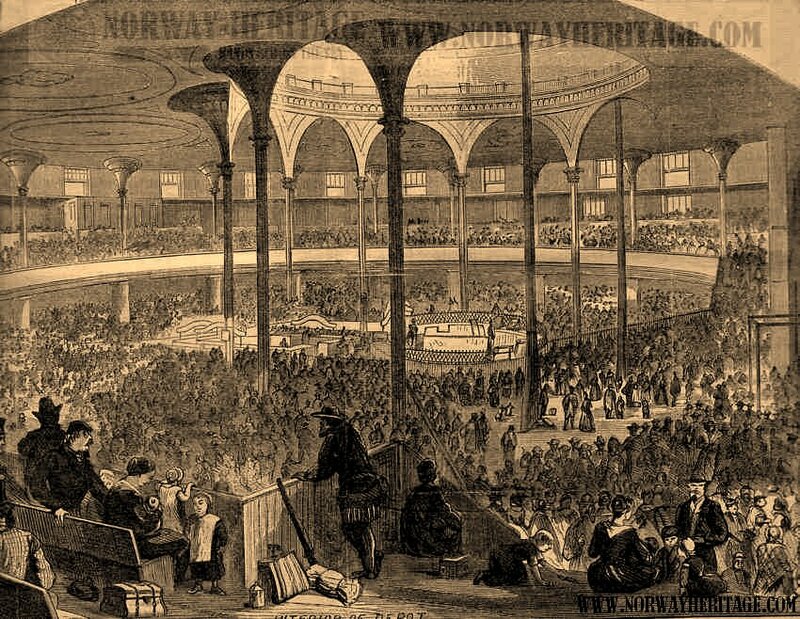 When Martin Brodowski arrived in New York, he would have come through Castle Garden, the predecessor to Ellis Island. There, he would have undergone the usual immigrant entry experience. 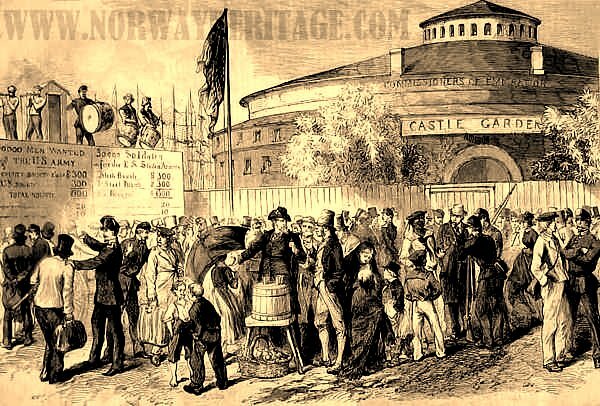 However, it is possible that Mary Brodowski chose to enter through Canada to avoid the various indignities of the Castle Garden experience. Upon entry, immigrants were checked for physical or mental defects or diseases and were questioned about their intentions and character. They were also asked where they were going and if they had a destination. Most travelers already knew someone who had emigrated and had advanced knowledge of the process and perils from those who had gone before. It is probable that the Brodowskis had family or friends as well as a destination in the US when they embarked. Their destination was likely Manistee, Michigan on the east shore of Lake Michigan. Manistee had a burgeoning Polish community where ample work was available in sawmills and two of the Brodowski's children were born there. 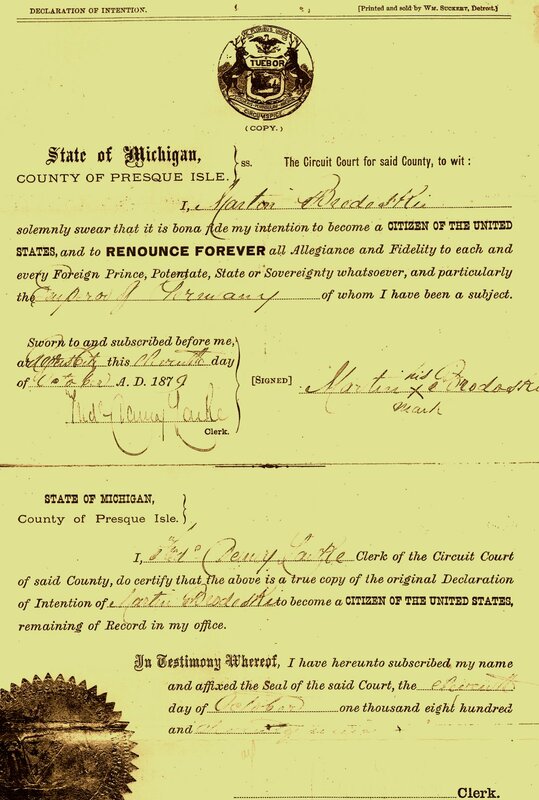 The Brodowski's first child, Victoria, was likely born en route to Michigan, while daughter Anna and son Joseph were born at Manistee in November 1876 and January 24, 1879, respectively. In 1880, the family appears on the US Census living in northeast lower Michigan in Presque Isle County, near the shore of Lake Huron. They were renting a farm in the little Polish farming community of Krakow, just outside present-day Rogers City. The Brodowski family's tenure in Krakow was brief, as Joseph had been born in Manistee less than a year before and the family had moved to Milwaukee by May 14, 1881 when son John was born. The Brodowski family moved to Milwaukee in the same year that Mary Brodowski's mother, brothers and sisters immigrated to Milwaukee. Mary's mother Francisca and siblings Michal, Anton, Joseph and Francisca all emigrated from the Swiatkowo area to Milwaukee in 1881, likely prompting the Brodowski family to move from Michigan to Milwaukee. The family settled in Milwaukee's Polish south side in a house at 860 20th Avenue (now S. 25th St). Martin worked as a day laborer while Mary was a homemaker. The Brodowski family continued to grow with son Frank arriving on February 29, 1884 daughter Mary on February 2, 1887, daughter Agnes on March 12, 1889, son Louis on August 28, 1891, son Theofil (Phillip) on February 11, 1894 and daughter Elizabeth in November 1895. Milwaukee had many parochial schools and the Brodowski children were all instructed in both Polish and English. The family attended St. Hyacinth Parish on Becher Street where their children also attended school. The Brodowskis in the summer of 1916 - Mary (Antoniak) Brodowski is seated (center), Elizabeth Brodowski is standing (center). Joseph Brodowski and Martha (Buretta) Brodowski are on the right with children Clara, Eugene, Norbert and Richard. On the left are John Brodowski and Kate (Ganas) Brodowski with children George, Alexander, Florence and Esther. By 1881, Milwaukee was home to a vibrant Polish community centered around the Mitchell St. area on the south side. One did not necessarily need to speak English to get around, and jobs and housing were plentiful. Most Milwaukee Poles in the 1880s worked at manual labor jobs in foundries, mills, tanneries and other industrial vocations. The work was difficult and dangerous, and many men were injured or killed in the workplace. At least two other Brodowski families had already settled in Milwaukee, mostly from other parts of Poland or from Russia. To this day, many Brodowskis live in Milwaukee who are not closely related to Martin or his descendants. The first of the Brodowski children to marry was daughter Victoria. On October 18, 1892, she married Michal Datka, who had immigrated from Padolin, Poland. They resided in Milwaukee for several years before Michal purchased a farm in Racine County near the town of Raymond. There, they raised a large family with children Wladislaw, Peter, Charles, Josephine, Regina, Clementine, Marion, Victoria, Benjamin, Genevieve and Irene. Michal and Victoria died in the 1940s or 50s, but their children left many descendants. The name Datka, is still a very common name in southeastern Wisconsin. Daughter Anna, appears to have been something of a family blacksheep, as she worked in a brewery and married a German boy, William Schultz in a civil ceremony in 1899. The same year, their daughter Harriet (Hattie) was born. Unfortunately, William died within a few years and Anna remarried to Jacob Kempf in 1902. Daughter Harriet married Anthony Peters and had a son, Anthony Jr. who married Mardell Praefke. The Kempf family lived at 462 Grove Street until Jacob's death on February 3, 1927. Following Jacob's death, Anna worked as a housekeeper at St. Mary's Hospital on Lake Drive, where she resided until she retired in the 1950s. Anna died October 20, 1961 in a New Berlin convalescent home. She proved difficult to research, as she is listed as Anna Camp in many family records and does not appear to have been particularly close with her siblings. 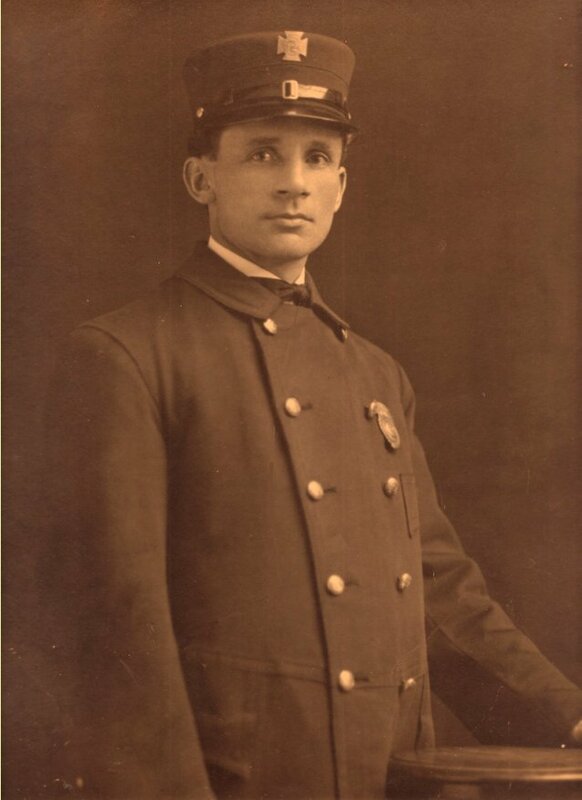 Son Joseph worked as a foreman in a tack factory before joining the Milwaukee Fire Department in 1904. He married Martha Buretta on February 5, 1907. Martha was from an old Milwaukee Polish family that had emigrated from the Blugowo area of Poland in 1881. 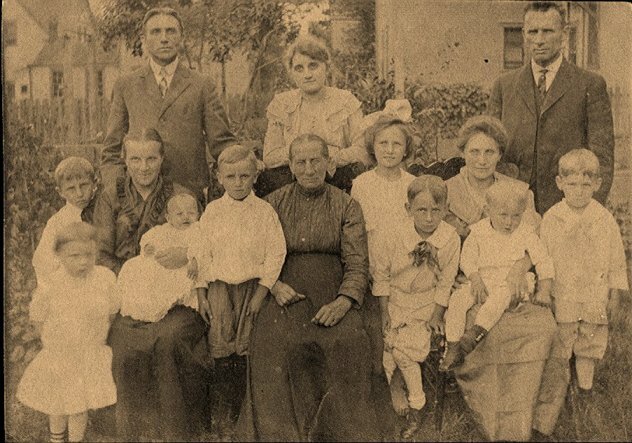 Together Joseph and Martha had 10 children including Clara (m. Stanley Konicke), Eugene (m. Evelyn Melka), Norbert (m. Louise Sowinski), Richard (m. Loretta Nowakowski), Leonard (m. Marion Pikulik), Mary (m. Harry Quartemont), Phyllis (m. John Wallus), Ervin (m. Phyllis Lund) and Daniel (m. Jane Mudrak). Joseph eventually rose to the rank of Assistant Battalion Chief and oversaw most of the fire stations on Milwaukee's south side before retiring in 1945. Joseph later changed his last name legally to Brody and his descendants now all use this name. Joseph's family resided at 882 9th Avenue where they lived with the Buretta family before settling at 1494 10th Avenue. Martha died on March 20th 1938 from cancer and Joseph later remarried to Pearl Musolf. Joseph served in the Spanish American War and passed away on March 31 1960 in Wauwatosa. He is buried at St. Adalbert's Cemetery, Section: 14, Block: 4, Lot: 8n2, Grave: 5, next to Martha. Son John married Katherine (Kate) Ganas on August 25, 1908 and settled in a home at 899 Maple St. John worked as a Machinist and the family had children George (m. Margaret Gergo), Alexander (m. Cecilia Kubicki), Florence (m. Arnold Brandt), and Esther (m. Rudolph Tonder). John kept the Brodowski name and a number of Milwaukee area Brodowskis now descend from this family. John died March 13, 1965 in St. Francis and is buried at St. Adalbert's Cemetery Section: 9, Block: 46, Row: 10, Grave: 4, next to Kate. The majority of the Brodowski family lived with John and Kate at 899 Maple Street, including Martin and Mary as well as Frank, Louis and Phillip, who were lifelong bachelors. Son Frank never married and after serving in the military, he worked in a tack factory and later as a teamster and in a packing house. Frank was blind in his left eye and died on January 10, 1966. He is buried at St. Adalbert's Cemetery, Section: 2, Block: 26, Row: 20, Grave: 3. Daughter Mary joined the Sisters of Notre Dame at a young age and served as a Roman Catholic nun under the name Sister Mary Rudolpha for her entire life. She taught at several schools over the course of her career, beginning her teaching career in Grand Rapids, Michigan and later returning to Milwaukee where she taught in area parochial schools, including St. Hyacinth. She died on April 18, 1975 in Elm Grove and is buried in the convent cemetery. 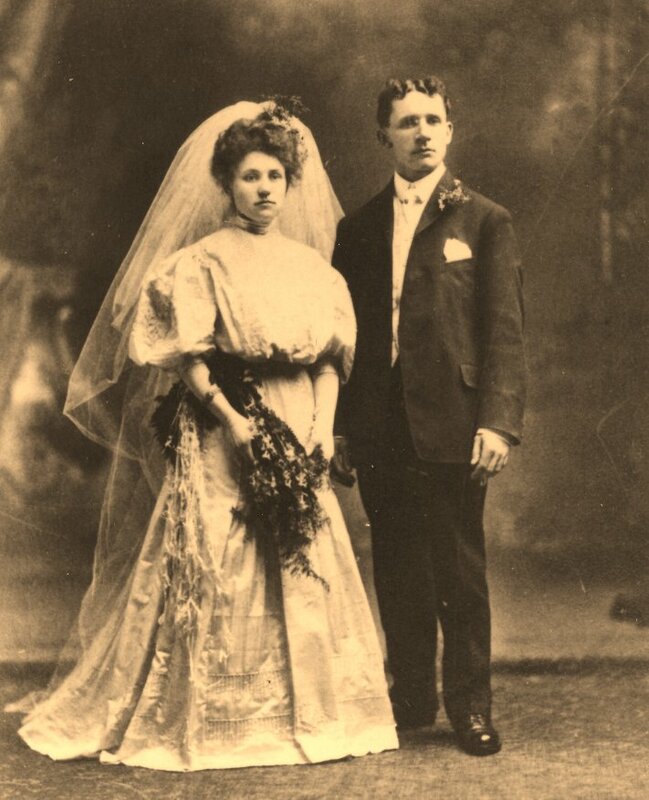 Daughter Agnes married Ladislaus (Walter) Kopczynski on May 20, 1907. Together, they had children Raymond, Alois, Eleanor (m. Harry Hartman), Arthur (Kopp) (m. Genevieve), Florence (m. Henry Latus), Ervin, Joseph and Norbert (m. Isabell). Arthur changed his last name to Kopp and most of this family's descendants now go by this name. Agnes died on September 13, 1969 and is buried at St. Adalbert's Cemetery, Section: 1, Block: 71, Row: 9, Grave: 15. Walter died in 1922 and is also buried at St. Adalbert's. Son Louis never married and after serving in the military, he worked as a teamster and later in a factory. He died on March 18, 1956 and is buried at Woods Veterans Cemetery, Plot: 36, row 7, grave 1. Son Phillip, like his two older brothers, never married. His given name was Theofil and he went by Phillip to his family, but he used the name Theodore in the Military and in his adult life. He served in the military in the Panama Canal Zone in 1920 and helped build the Canal. There, he contracted Malaria, which proved to be a lifelong health problem. Phillip worked as a teamster and later as a tire mechanic. He died on February 22, 1936 and is buried at Woods Veterans Cemetery in Milwaukee, Plot: 28, grave 118. Daughter Elizabeth married Joseph Wedor on November 29, 1922. Joseph was a Milwaukee police officer and the couple had two children, sons Cornell (m. Rosemarie) and Donald (m. Gwendolyn). They lived at 1092 2nd Ave and later at 2505 S. 8th St. Elizabeth died on June 24, 1956 and is buried at Holy Trinity Cemetery, Block: 8, Lot: 8. Joseph died November 19, 1986. Martin worked as a day laborer and died at the family home at 899 Maple St. on March 28, 1907 He is buried in St. Adalbert's Cemetery, Block: 6, Row: 2, Grave: 1 . Mary lived a long life, passing away on July 4, 1939 at 2505 S. 8th St. near St. Josaphat's Church, where she lived with the Wedors. Martin Brodowski appears to have been the only member of his family to emigrate to the Milwaukee area. There is no evidence that any other Brodowskis in Milwaukee came from the same part of Poznan. However, several Milwaukee Antoniaks were related to Mary, including her brothers Michael Antoniak, Joseph Antoniak and Anton Antoniak and sister Francisca Antoniak. Today, many Antoniaks in the Milwaukee area descend from this family. It is interesting to note that Mary's death certificate lists her father's name incorrectly as Michael Antoniewicz. There is also an oral tradition in the Brodowski family that Mary Antoniak had one parent who was Jewish. To date, I have traced the Antoniak and Galwas families back several generations in Poland. Mary Antoniak's father was Peter Antoniak (b. 1819). Peter's parents were Andreas Antoniak (b.1791) and Marianna Nowak (b.1795). Andreas Antoniak's parents were Matthias Antoniak and Eva Antoniak. Francisca Galwas' parents were Andreas and Sophia Galwas. All were from Kozielsko, about 15 miles from Swiatkowo. Today, the descendants of Martin and Mary number in the hundreds. A reunion of Joseph Brody's descendants was held in the 1980s, during which many family members were able to reconnect, but it is unlikely that most of us will ever meet. However, given the increasingly generic nature of American society, it is important to retain a sense of one's ethnic heritage. Milwaukee's Polish south side has now been repopulated by a new generation of immigrants. It is extremely interesting to visit the original homes of our Polish ancestors. I recall during the late 1980s when I began researching Milwaukee Polish genealogy, seeing these home occupied by large extended families, much as they had been 100 years earlier. The neighborhoods still had a palpable sense of their original immigrant character. If you have the opportunity, take the time to visit the old neighborhoods, see the original homes and to tour St. Adalbert's Cemetery, where most of the Brodowski ancestors are buried. I'll be happy to provide additional information to anyone interested and can be reached by emailing brendon@baillod.com. I have placed the entire Brodowski genealogy online at http://worldconnect.rootsweb.com/cgi-bin/igm.cgi?op=GET&db=2188007&id=I0032. It is publicly accessible, but names and dates for living persons are not shown. I would be happy to provide a detailed listing that includes names and dates for living persons to any relative who wishes. I would also welcome updates and corrections from relatives. I look forward to hearing from you.